"Good things come to those with Bait"
Many of my Giant Lure Sculptures are modeled from the classic wooden plugs I grew up fishing with. Others are modern lures that I now fish with or lures which have some quality that I admire. I sculpt my lures from native cypress . Each is carfully balanced to hang from a single point and turn easily in the slightest breeze. They are very realistic in both form and finish . The hooks are real. Someone once described my work as art that makes you laugh. Others see a giant lure and remember the time spent fishing with his dad or grandad. My sculptures are carried in top galleries across the US and have been featured in both FineWoodWorking Magazine and Craft Magazine. I have also done many comissioned lure sculptures for both indivduals and lure companies. Visit the Big Time Baitshop to purchase a lure . My giant fishing lure sculptures make a great fisherman's gift and fishing lure collector's gift . Decorative fishing lures also make great corporate gifts and restaurant decoration as well as kitchen decoration and office decoration. They make a great sportsman's gift and are appreciated by fishermen and fishing art collectors everywhere. .My fishing lures fall into the catagory of sports art , wildlife art ,fishing art ,fishing gifts,and fishing collectables. 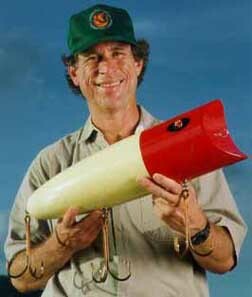 Many fishermen have purchased my giant lures to commenorate the actual fishing lure on which they caught a trophy size fish. My giant lures make and affordable alternative to a fish mount and look great as a kitchen decor, office decor, or restaurant decor . As a fishing gift my giant lures are appreciated by fishermen and fishing lure collectors everywhere and have often been purchased by the fisherman himself for office decoration or as a fishing gift for a valued friend. My giant fishing lures also make very fine fishing awards and fishing trophys for fishing rodeos and fishing tournaments. All Big Time Bait Lures � Copyright 1995-2013 Ken Picou Design. All rights reserved.